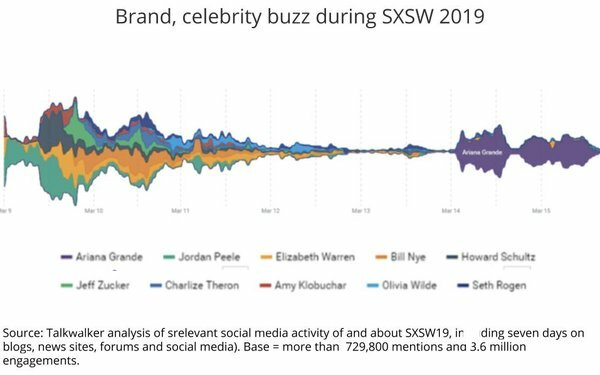 The top brand mentions on social media platforms surrounding this year's SXSW festival included Uber Eats (424 mentions), IBM (306 mentions) and SoundCloud (267 mentions), according to an analysis released today by social listening and analytics firm Talkwalker. Uber's buzz emanated from the Uber Eats stage at the festival, while IBM was related to its blockchain industry statements. In general, food was on the mind of the SXSW social media community. With 603 mentions, it was the leading topic, followed by design (380 mentions) and sports (159 mentions). * That Microsoft's "Halo" videogame is finally coming to PC (47,300 shares/likes). * Solange Knowles' new BlackPlanet page (33,800 shares/likes). * Korean K-pop band iKon announce their SXSW concert date (29,400 shares/likes). * Performer Ariana Grande (3,400 mentions). * Former House Speaker turned cannabis executive John Boehner (115 mentions).